(1963) Cesar Romero, Frankie Avalon, Broderick Crawford. 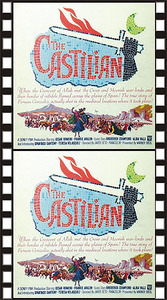 An adventurous Castilian nobleman leads his people in a series of daring raids. He is counseled by two patron saints and later falls in love with a beautiful princess. One of our better-selling sword and sandal titles. Color, 16mm.